which briefly impacted the area receded. A weekend of rain brought 1-3 inches of moisture and even a few tornadoes. 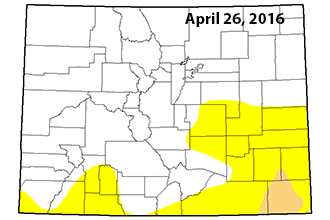 Despite that improvement, much of Baca County and smaller portions of Las Animas, Bent and Prowers Counties remain in moderate drought. The remainder of the week will remain cool, and widespread rain is expected starting later in the day Thursday, continuing into Friday across southern Colorado. A lesser chance of precipitation will remain throughout the weekend before dissipating Monday night.